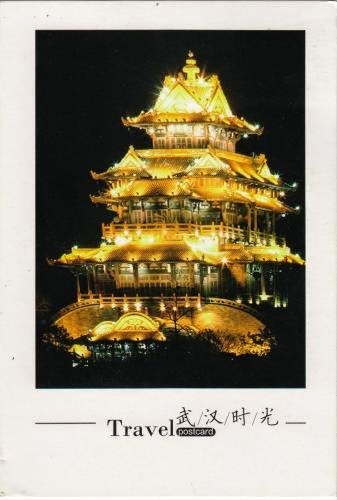 Postcard CN-988823 from China shows a night view of the Yellow Crane Tower (黄鹤楼), a historic tower first built in 223 A.D., overlooking the Yangtze River from the Snake Hill in Wuhan, Hubei, China. Hubei (湖北), a province in the easternmost part of central China, covers the territory of the ancient state Chu (楚) during the Warring States period of the Zhou Dynasty, where its minister and poet Qu Yuan (circa 340–278 B.C.) called home. Once served in high offices, Qu Yuan was banished for his opposition to the alliance with the powerful state of Qin, and accused of treason. Qu Yuan was very productive and wrote a lot of poetry during his exile. Twenty-eight years later since his exile, Qin captured Ying (郢), the capitol of Chu. With his early prediction validated, Qu Yuan threw himself into the Miluo River (汨罗江), a branch to the Dongting Lake in the Yangtze River watershed, in protest by suicide. The legend says that local people, who admired him, raced out in their boats to save him, which became the origin of dragon boat races. In despair, they also dropped sticky rice balls into the river to distract fish so that those fish would not bite Qu Yuan's flesh. Those rice balls thus became the origin of zongzi. The date of his death has been commemorated as Duanwu Fesitival or Dragon Boat Festival to celebrate Qu Yuan's patriotism, which occurs on the 5th day of the 5th month of the traditional lunar calendar. The date varies from year to year on the Gregorian calendar. In 2014, it falls on June 2.